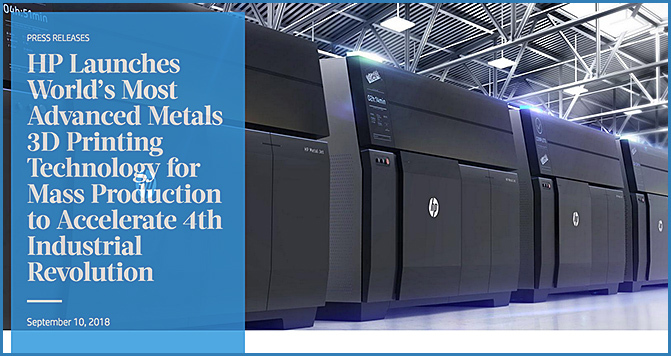 HP just announced its first metal 3-D printer, along with a several high-profile customers. Some background: Metal 3-D printing has been slow to take off except for niche applications. But over the past few years it’s begun overcoming its cost and speed barriers (prompting us to make it one of our 10 Breakthrough Technologies of 2018). The news: HP’s new printer, HP Metal Jet (which will run you about $400,000), launched yesterday. Off the bat its machines will be used by GKN Powder Metallurgy, which makes more than 13 million parts a day, as well as Volkswagen and metal manufacturer Parmatech. “The world runs on metals—hundreds of billions of metal parts are produced each year,” says Tim Weber, global head of 3D printing materials and advanced applications at HP. The tech: The machine will use a process called binder-jet printing, which uses layers of metal powder and a binding agent (which acts like glue) to build up a part. These fragile products are then heated until they melt into the finished design. The advantage: The company will be up against longer standing metal 3-D printing rivals, including Desktop Metal, GE, and Markforged. HP’s feels its real leg up is its ability to use many of the same elements used in its other 2-D and 3-D plastic printers in its metal machines. How it’ll change work: Metal 3-D printing has the potential to further automate the manufacturing floor. The printers require less human involvement to keep them running than many other pieces of equipment. The technology could also allow large factories that mass-produce a limited range of parts to be replaced by smaller ones that make a wider variety, changing where and how people work. Such competition can help push prices down and drive innovation.